Conserving rainwater is increasingly important as different areas of the country go through drought. Rather than letting rainwater flow through gutters and downspouts into the ground, there are different ways to collect the rainwater. You can use the water for watering gardens, which is better than using treated tap water. Rainwater is also less expensive to use. Some people have eliminated gutter downpouts and replaced them with rain chains and rain barrels. In this article, Cajundood takes a different approach. 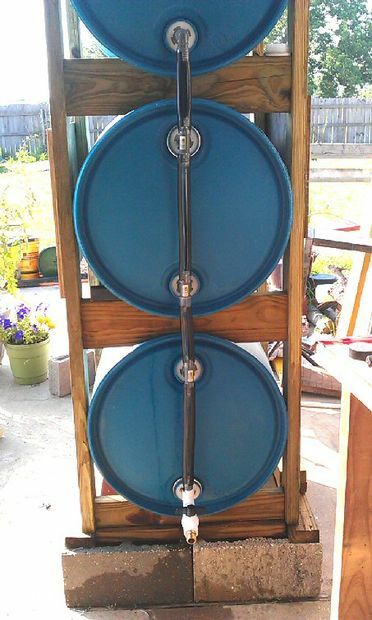 He refined the design of another DIYer and created a 3 drum rain water collection system. The drums are stacked horizontally on top of each other using a wooden frame and cradles. Each drum had two holes on one end. He explains how to connect the drums using plastic tubing. He removed the downspout and used a funnel and tubing connector to divert rainwater from the roof and gutter into the top drum. The water then flows into the bottom barrel until it’s filled, then the middle barrel and finally the top barrel. It’s a neat DIY project. There is some discussion about using this system to collect rainwater to use as drinking water in the event of an emergency that interrupted the standard water supply. In order to do that, it would be advisable to add some wire mesh to filter out contaminants at the entry point into the top barrel. To see the system, click on the How to Build a 3 Drum Rain Water Collection System link below.